French painter. He was born into a family of artists in Toulon: his grandfather Jean (c. 1660-1721) was a decorator of naval vessels and painter of religious works; his father, Jacques Volaire (1685-1768), was official painter of Toulon between 1729 and 1766 and in 1745 was commissioned to paint a large Glory of the Holy Sacrament (Toulon Cathedral); his uncle Franois-Alexis (1699-1775) was also a painter, and his cousin Marie-Anne (1730-1806) was a portrait painter. In 1755 Volaire is documented (as le fils ) working on the restoration of paintings in Toulon Cathedral. In September 1754 Joseph Vernet arrived in Toulon. He was painting a series of topographical views of the major French seaports for Louis XV. Almost certainly Vernet took on Volaire as an assistant in 1754 or 1755, although this is not documented until 1759. Volaire s role in the series of ports is unknown; it may have been merely mechanical, but he could have provided expert knowledge of the military port of Toulon and French naval life. From his master Volaire learned a sharp sense of observation, a lively technique and care in the design and lighting of a painting. He was Vernet s most inventive follower, not content to copy his master s well-tried formulae but prepared to adapt to new aesthetic criteria. 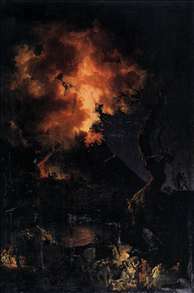 In 1769 Volaire left Rome for Naples, where night scenes became his specialty, showing silhouetted figures against vivid contrasts of cool moonlight and warm fires. 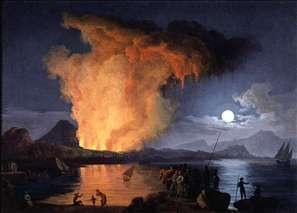 He painted several scenes representing the eruptions of Vesuvius since there were a number of eruptions during his sojourn in Naples. See more details about "The Eruption of the Vesuvius"
See more details about "View of the Eruption of Mount Vesuvius"